So what have we done so far with our roast chicken leftovers (apart from store them safely in the fridge of course)? Well one of the favourite options is to rustle up a quick curry – always good whether you go for a creamy or a tomato based option. Probably not very authentic but WAY BETTER than anything you’ll get in a supermarket heat and eat; and believe me I know, I’ve tried a lot of heat and eat curry in my time searching for one that’s vaguely good. They are few and far between. Even if the supermarket recipe started out more authentic it’ll never taste quite as fresh and zingy as something you do yourself. So next time you’ve some leftover chicken gives this recipe a whirl and your taste buds a treat. We went for a tomato based option and did a side of chickpeas and purple sprouting broccoli (because we happened to have a few bits of the latter lurking in the fridge drawer). 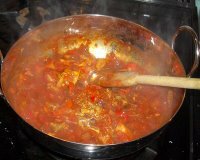 (enough for two – scale up with the chicken meat for greater numbers and add some water if there’s 4 of you, more tomatoes if there’s six – we could have made enough for six with the meat we had left but decided to save it for later in the week). The pan: we always use some kind of low sided sauté type pan for curry as this helps the sauce thicken faster than a regular sauce pan would – which is quite important. The onion: we pretty much always start by frying up an onion fairly finely chopped so its starts to colour but not get too dark (it can get bitter if it over colours though I have found a great curry recipe with really crispy onion but I’ll save that for another post). The spices: then we add the spices which are a mix of mostly freshly ground and a few ready prepared; we just go with the flow of what we fancy taste wise and how hot we want it to be (this last point always being up for a bit of debate as I’m a bit of a curry wimp when it comes to the chilli content). This time we used coriander and cumin seeds, ground turmeric, dried chili flakes and a chopped fresh red chilli. We toss the spices with the onions for about a minute to start to release the flavours – boy does it start to smell lovely. Tomatoes: we add a tin of chopped tomatoes and raise the heat so it all starts to simmer down. The chicken: as the tomatoes begin to bubble quite vigorously we add the chicken meat, which I’ve pulled off from one of the legs and cut into smallish chunks. We leave this to bubble away fairly rapidly, keeping an eye out and stirring every so often to prevent it catching on the pan bottom. 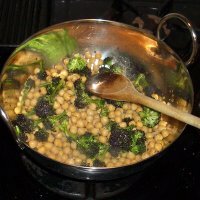 While that’s working its curry magic we get the chick peas and sprouting broccoli on the go, cutting the latter up into small florets and tossing with the chick peas, a tiny bit of water and a few twists from a garam masala spice mill plus a good dollop of greek yoghurt to coat everything. This cooks away and thickens whilst we pop on the basmati rice and get some bowls warming. The chicken curry needs a good 20- 30 minutes of swift bubbling to get the chicken heated through and the sauce nice and concentrated, the chick peas and broccoli need about 15 minutes cooking (thought they’ll survive more if the timings go a bit awry) and the basmati needs 10 minutes boiling and few minutes after its drained to help fluff up. Then its into the waiting bowls, to the table and dive in for a tasty curry experience. Pretty good all round authentic or not. Oh and there still at least two meals left on the chicken before we even get to thinking about maybe making stock. I went out for a really good Indian curry on Saturday night to quite an unusual restaurant. It’s a place called Spiceland, situated in a motorway service station (yes, really) just off the A1 near Sawtry – it’s actually pretty difficult to find. The restaurant isn’t licensed although you are allowed to take your own alcohol – and lots of people do – and specialises in the self service eat-all-you-want for a fixed price thing. Service is non existent – they dump you at a table and chuck down soft drinks in a rushed surly way. Doesn’t sound too great does it? However – the food is really very good, and to prove it whenever we’ve gone the place is always teaming with people. Although the food sits in those food warming jobs it goes so quickly that they are constantly being replaced, so everything is hot and tastes fresh. So it only goes to show that if the food is good people will turn up in droves – no matter how strange the location. It sounds almost too surreal to be true. I checked it out by googling and the pictures look a bit off putting (http://www.spice-land.co.uk/intro.html) but reviews on various sites do to rate it. I guess if you are daring enough to get past the way something looks there are some gems out there but it takes a recommendation or a high risk approach to just go for it. Next time I’m near that bit of the A1 I’ll give it a go.